Fit Fluential Mom: Clean Chocolate Trufflfes? Yes please! Chocolate? Who said chocolate? Heck who doesn't say chocolate! I love it but I love making it myself more than buying the store bought types. And truffles are especially delicious. Try out this recipe with only 5 ingredients and 10 minute prep time! 1. 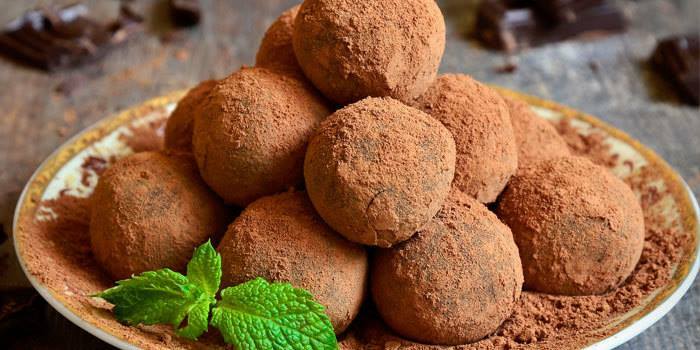 Place chocolate, coconut oil, and mint extract in a small bowl; mix well. Set aside. 2. Bring coconut milk to a gentle boil in small saucepan over medium heat. 3. Add coconut milk to chocolate mixture; whisk gently until combined. 4. Place chocolate mixture, covered, in refrigerator for at least 4 hours or overnight. 5. Using a melon baller or spoon, scoop out 1 Tbsp. of chocolate mixture. Roll into a ball. Roll in cocoa powder until evenly coated. Repeat steps five and six until there are twelve truffles. 6. Store in refrigerator for up to one week or in freezer for three months. These would be counted as a treat. For my containers, I measure them with the orange container so whatever fits in there is 1 serving. I also count it as 1 purple for the day because of the sugar in the chocolate and coconut milk. Via the Team Beachbody Blog. Click the link for more recipes and helpful fitness and nutrition tips!